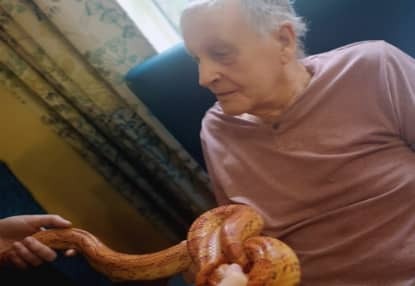 Residents at Sutton Hall & Lodge were delighted to be joined recently by the fantastic people at ZooLab and their variety of strange creatures. Also in attendance, were the local primary school who were eager to take part in the animal handling experience. ZooLab brought a variety of exotic creatures including a Giant Snail, a Gecko, A Hedgehog, Rats and even… a Tarantula! These wonderful animals were passed around the residents and children for a closer look. Residents found great enjoyment in watching the children’s reactions as they handled the creatures. Smiles and laughter surrounded the room as children and residents alike learned all about the animals. “The children’s faces were an absolute picture when they were looking at the different creatures, especially when they brought out the Tarantula”, commented Karen Steele, one of the Activity Coordinators at Sutton Hall & Lodge. “We can’t wait to see what ZooLab bring for us next time”, added Karen.